Brey-Krause offers a variety of solutions to extending space inside the shower. Curved shower rods allow for an additional six inches of space at the center of the rod. All of the Brey-Krause curved shower rods are designed and engineered for heavy duty use. Only 18 gauge, high-quality stainless steel is used in the fabrication process, with 100% USA made components and labor. 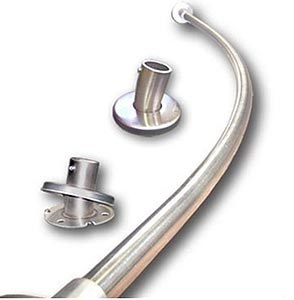 The curved shower rod comes complete with both the shower rod as well as the two mounting flanges on either end. The screws and mounting flanges are concealed by a snap-on stainless steel cover. Set screws are tightened in place to keep the curved shower rod from rotating.